Great News! 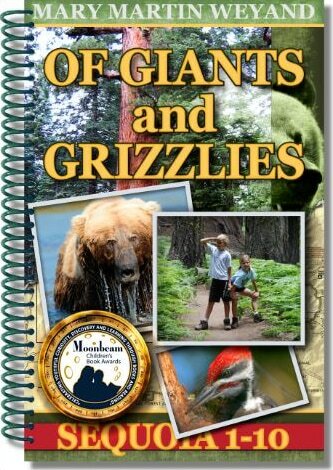 Moonbeam Children's Book Awards announces Of Giants and Grizzlies the 2015 Gold Medal Winner, Ebook, Non-Fiction. ​Of Giants and Grizzlies captures the past and the present of Sequoia National Park. Learn how the giant trees, the marble caves, grizzly and black bear, bug-eating plants, birds that fly underwater and so much more are faring today. Secondary reading material for mid-grade students studying California history and natural science. Educational, full of great photos with access to free teacher guides and learn more with video links. You can choose the convenient spiral-bound print version, the complete digital eBook version, or select individual chapter "mini-book" digital versions below. Convenient to use 5.5 x 8.5, Spiral-bound print version. Mobi version is suitable for Kindle devices or Kindle for PC. The Giant Sequoia towered over dinosaurs millions of years ago, and survives still today in the Sequoia and Kings Canyon National Parks of California. Many specimen are over 3000 years old, and were growing way before America was discovered. Its seeds are so tiny that hundreds can be held in a small hand; its thick bark is spongy and provides its own fire protection. Lightning struck time and again, they live and breath and continue to grow, thanks to the rigorous efforts of Walter Fry and others who joined him to save these giant trees. Secondary reading material for mid-grade students ages 9 and up studying California history and natural science. Mobi version is suitable for Kindle devices and Kindle for PC. One of the last of California's great grizzly bears was tracked by Superintendent Walter Fry in Sequoia National Park in the early 1900's. It scattered black bears from their feed and left huge paw-prints in its wake. The loss of these great bear from California is a wake up call. Today children learn the importance of preserving the flora, fauna and landforms of our national parks, and preserving the balance of nature for future generations. Secondary reading material for mid-grade students studying California history and natural science. Secondary reading material for mid-grade students ages 9 and up studying California history and natural science. Enjoy a great tale told by Walter Fry, Sequoia National Park's first civilian superintendent. His account of two black bears feasting on the carcass of a dead cow, and a serious challenge by one hungry and determined wolverine provides a good laugh. We learn how black bears bulk up for the winter, and give birth during hibernation. Adult bears and their cubs survive well when they consume wild food. They remember the best spots to get bulbs, berries, nuts, fish and rodents, thus distancing them from human food and the potential of an untimely demise. Secondary reading material for mid-grade students ages 9 and up studying California history and natural science. Sequoia National Park's Huckleberry Meadow teems with life. We are fascinated as Walter Fry walks us through his experiment in feeding the carnivorous sundew plant, that still grows along the moist meadows' edge. From opportunistic swimming snakes, to hungry black bear feeding on tender spring bulbs, the meadow puts on a show. Bumblebees rush to pollinate, trucking pollen back to the hive on back legs. Pacific chorus frogs sing their song made famous by Hollywood, while a bevy of birds set up shop to fill up on flying insects. A 360 degree of their world makes the dragonfly a first class flying ace as it wings over the tree-framed meadow, in a Harvard University video. Secondary reading material for mid-grade students ages 9 and up studying California history and natural science. Mobi version is suitable for Kindle devices. Get to know the pika, an endearing round-eared rabbit that lives in the talus rocks high in the mountains of Sequoia and Kings Canyon National Parks. On his frequent ride-throughs by horseback, first superintendent Walter Fry always checked on the pika. Hard to spot, as its fur blends with the terrain, an eek-eek alarm call is a definite indicator of their presence. Known for creating miniature haystacks of wildflowers and plants to get them through a snowbound winter, they dutifully tend their cache of food, to the delight of everyone who watches. Secondary reading material for mid-grade students ages 9 and up studying California history and natural science. Upon its discovery in 1918, Walter Fry, first superintendent of Sequoia National Park gave Crystal Cave its name. Awestruck by the beauty of the formations in the marble-walled caves he declared that "nature had lavishly traced her design in decorative glory." Finally secured for public visits, the cave has been a favorite for millions who have enjoyed the "mass of stalactites . . . some drop down from the ceiling in great folds of massive ‘draperies.'" Many more caves have been found nearby since then, and with them the discovery of human bone fragments. Native people made use of these same caves for hundreds of years before modern man. Secondary reading material for mid-grade students studying California history and natural science. Secondary reading material for mid-grade students ages 9 and up studying California history and natural science. The American Dipper bird was extolled by contemporaries Walter Fry and John Muir alike. Its dark gray color, small stature and commitment to fast moving water make it hard to notice. Even today it blends completely with the waterways of Sequoia and Kings Canyon National Parks. Remarkably, it gathers its food at the bottom of streams, walking along in rushing water as if it hasn't a care. A mayfly larvae acquired, it heads from stream bottom to tree branch and lets loose with a song complicated enough to make Irving Berlin feel envy. A video shows its talent and invites us to look for this avian dweller. Secondary reading material for mid-grade students ages 9 and up studying California history and natural science. In 1911, Superintendent of Sequoia National Park, Walter Fry camped in the trees in the same area where a pair of pileated woodpeckers (made famous by Walter Lantz's cartoon character) were busy with nest-building. Having built large nests in tree trunks, their eggs, then offspring, were cared for by both parents, ‘Cap’ and ‘Phoebe.’ The sudden killing of Phoebe left Cap a terrified widower, and the story of his brave attempts to feed and care for his four begging nestlings is shared by Fry with warmth and humor. Videos offer a good look at some of today's pileated woodpeckers. Secondary reading material for mid-grade students ages 9 and up studying California history and natural science. Walter Fry left his Kansas farm in 1887, at age 28, to get a new start in California. With his wife Sarah, and Clarence, his only child to survive an epidemic, they arrived by train in Tulare, California. Enthralled by the Giant Sequoia, by the plethora of animals and the stunning beauty of the Sierra Nevada, he was one of the first to sign the petition to make Sequoia our nation's second national park. He held a variety of roles until 1914 when he was named the first civilian superintendent of Sequoia National Park, and finally commissioner. His journals, and Park Bulletins are a rich resource for Of Giants and Grizzlies. Secondary reading material for mid-grade students ages 9 and up studying California history and natural science. New Release News Mailing List. *An Internet connection is required to view external multi media portions of our mobi version. Non-kindle device owner? You may need to download the free Amazon Kindle App to access our books. *Depending on specific device configurations and current industry reader application limitations, some devices might not have access to, or may not display this book at intended performance levels.